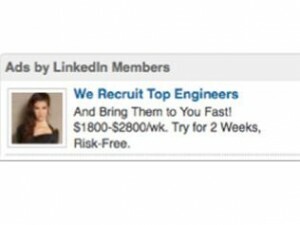 Professional networking site LinkedIn has been forced to reverse its decision to block images of female engineers posted by engineering company TopTal. LinkedIn blocked the ads after allegedly receiving complaints from LinkedIn users about the suggestive nature of images used. It’s believed the advertisements used a mixture of stock photographs and images of male and female staff. The most debated image is of real-life software engineer Florencia Antara (pictured). Antara is undoubtedly an attractive woman and some commenting on TopTal’s blog post believe that the image is too suggestive to be relevant for an engineering ad. ‘The images are a bit suggestive and I would like to kindly turn the tables and ask you why you felt you needed to portray these women in such a sexually suggestive light than a professional light,’ one reader commented. ‘The text sounds scammy and the photos of attractive women just give the entire thing a “spam” feel. It’s not a slight against female engineers,’ said another. This sort of feedback is believed to be what motivated LinkedIn to block the ads in the first place. TopTal initially reposted the images themselves but soon found their account blocked entirely. The issue then gained significant attention on Twitter, leading to LinkedIn’s ultimate decision to unblock TopTal and the advertisements in question. A spokesperson for LinkedIn said the ads were rejected in error while the customer service team was going through the standard review process. While the legitimacy of TopTal’s complaints of sexism in this case may be questionable, it is interesting to see how much attention the issue gathered. The idea that a woman can be ‘too hot’ to represent someone in the tech industry certainly deserves discussion. A more significant question would be why should someone’s attractiveness be an issue at all when spruiking engineering? It would be unlikely that people would complain that a male (from a stock photo or real life) was too good-looking to be an engineer, yet one way or another, photos of women were taken down for that reason. What do you think, Lipsters? Are women over-sexualised in advertising? Are the people of LinkedIn who complained about the images being sexist in assuming a female engineer can’t be attractive? Would you assume an attractive woman in an ad for the tech industry was a model, or a part of that industry? Let us know below! This entry was posted in News and tagged gender, in brief, sexism, technology, women. Bookmark the permalink.